Once he's done making Epic Mickey, Warren Spector has plans for Huey, Dewey, Louie, and Scrooge McDuck. It's been established that Warren Spector's Junction Studios is probably going to make Mickey awesome. The upcoming Epic Mickey is a Disney game that kicks some of the kid-friendly formula to the curb to add more exciting game elements. Spector would love to do the same with other Disney characters, if allowed. In particular, Spector puts the quackers from DuckTales at the top of his list. When asked by IndustryGamers if he'd like to work with other Disney characters after Mickey Mouse, Spector said: "Oh, heck yeah." Spector seems to be a litle crazy for the characters, actually. He says: "A day does not go by where I don't tell somebody at Disney: 'Gimme the ducks. Gimme the ducks! Uncle Scrooge, come on! Donald! Huey, Dewey, and Louie! Come on, let me do a duck game!'" 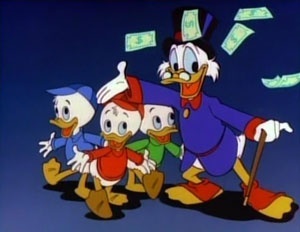 DuckTales got its start in a comic book created by Carl Barks and became a cartoon that featured Scrooge McDuck and his triplet nephews Huey, Dewey, and Louie. McDuck is the richest duck on Earth, and owns a vault filled with money that he likes to swim through from time to time. He's constantly trying to become even richer, often going on adventures throughout the world. DuckTales was actually already made into a couple of games for the NES (later ported to the Game Boy) by Capcom and they were pretty good. They're non-linear and have multiple endings depending on how many of the world's treasures you're able to collect as Scrooge McDuck. Spector calls McDuck "Indiana Jones before Steven Spielberg was a gleam in his mother's eye" and "a great character." He wants to bring some of Carl Barks' work "to life in games." If Epic Mickey does well, why not let Spector tackle more of Disney's roster? He could have the ducks solve a mystery, or even rewrite history. I have three words for Spector if he's able to make this happen: Darkwing Duck level.